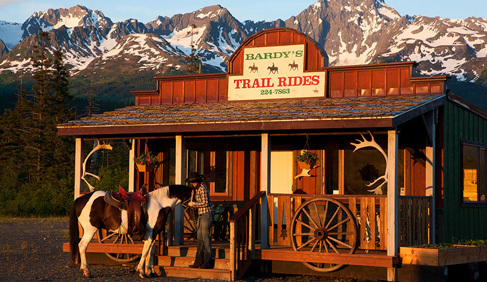 Bree Bardarson, the owner of Bardy's Trail Rides, is featured in Equitrekking's Alaska episode and in Equitrekking articles in USA Today, Trail Rider and Practical Horseman magazines. 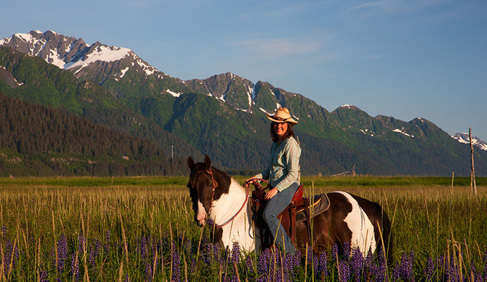 On this Alaska horse riding adventure, horse ride in an area of Seward that is only accessible by horseback. View bald eagles up close and see where they nest and watch them feed. 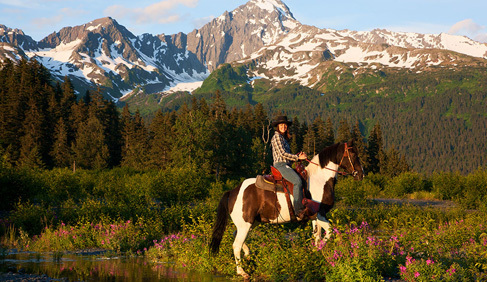 Horseback riding in Alaska is a great way to get into the woods and see Alaska’s dramatic scenery. Horse ride through part of the old town of Seward that was destroyed by the great earthquake of 1964. Hear first-hand stories of the people who lived through it. 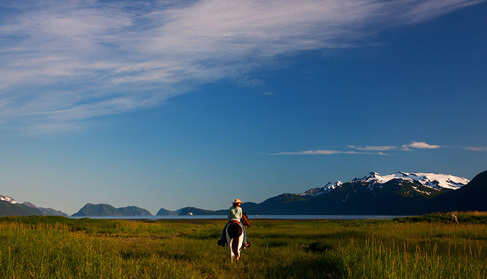 Ride horses on the beach along the shores of Resurrection Bay, where the wild flowers meet the ocean. For bird watchers, bird life is diverse, active and up close. This Alaska trail ride could very well be the wilderness highlight of your trip to Seward and Alaska. Bardy's Trail Rides offers two trail rides a day, beginning at 12 pm and 3 pm (check in 20 minutes early) during the months of May, June, July and August. the Seward Highway National Scenic Byway–– Drive this scenic 127 mile highway, which stretches from Seward to Anchorage before or after your riding adventure. The Seward Highway has been called one of America’s Most Scenic Drives. Leave extra time to make stops by glacier fed lakes, snow capped mountains, dense evergreen forests and local wildlife. Alaska Railroad- The train docks in walking distance from the Seward small boat harbor. This Alaska Trail Ride could very well be the wilderness highlight of your trip to Seward and Alaska. Seward, Alaska on the Kenai Peninsula. Two trail rides a day, beginning at 12 pm and 3 pm (check in 20 minutes early) during the months of May, June, July and August. Cash, Check Credit Cards- cost per person is $109 for about a 2 hour ride (plus tax totals $112.27).